Have you ever heard of ‘Genghis Khan’? No, I am not talking about the Mongolian emperor who built the Mongol empire. The one I want to talk about is a name of the famously grilled mutton from Hokkaido, which for some reason named after the Mongolian emperor. Basically, it is a thin-sliced-yakiniku-type mutton beef, grilled on top of the metal skillet. Some people said that the original shape of the metal skillet resembles the shape of a Mongolian soldier helmet, but honestly, we were not sure of it. 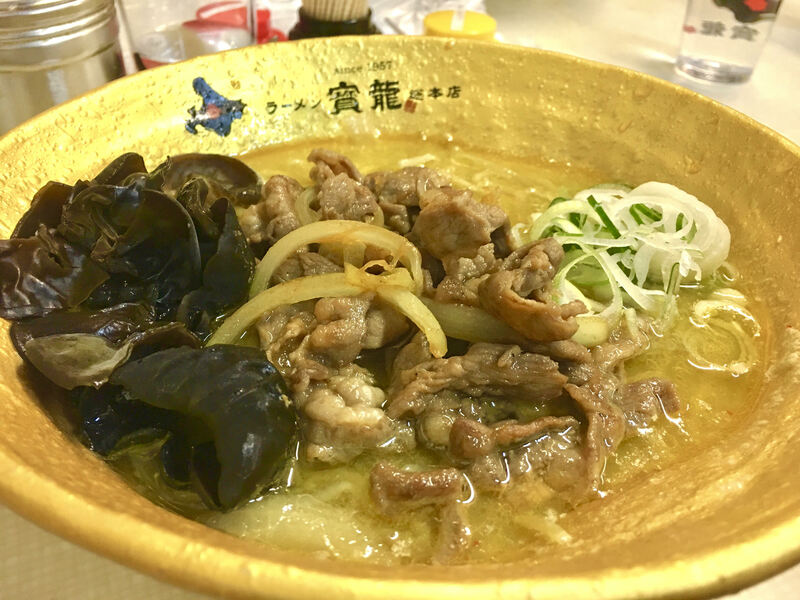 Nevertheless, mutton is not frequently eaten in Japan except in Hokkaido. So if you visit Hokkaido, you have to try it. 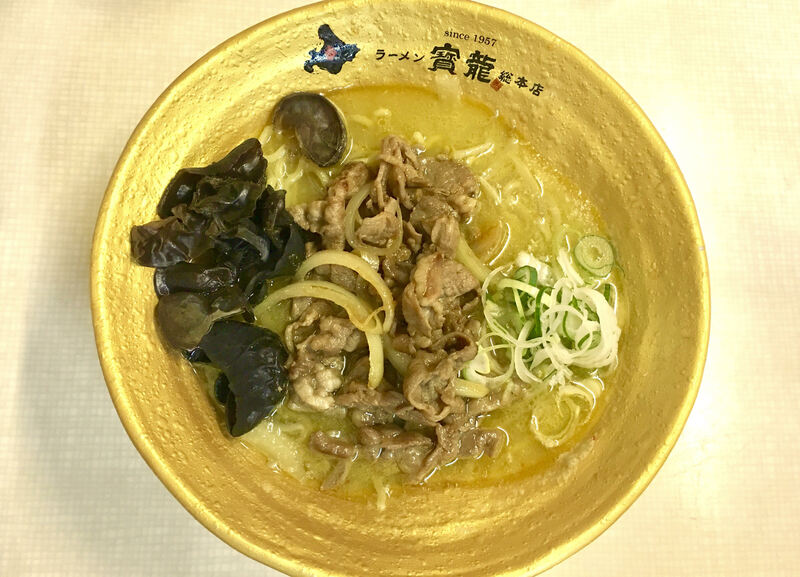 In Sapporo, there is a famous halal ramen store that served Genghis khan ramen: Ramen Houryu (寳龍). 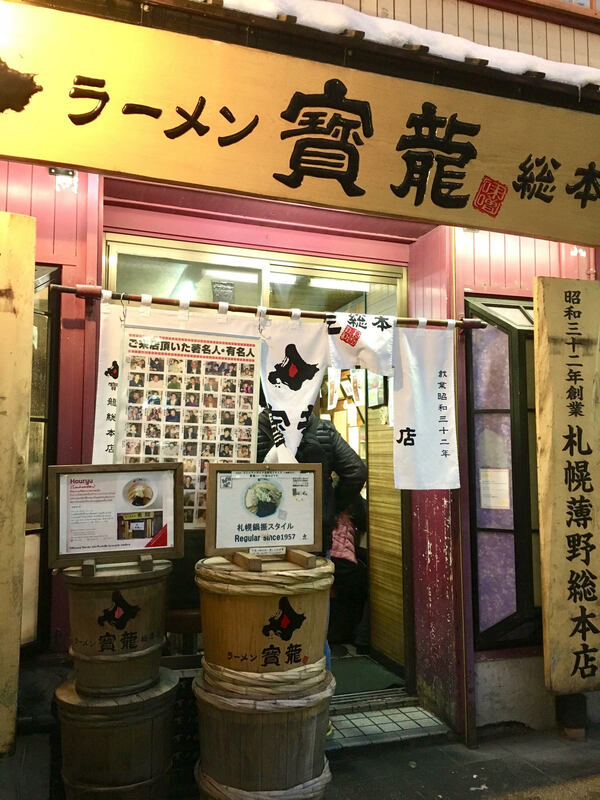 Ramen Houryu opens since 1957. Not all of the food on their menu is Halal, but do not worry they use different cooking utensils and cutlery for the halal menu. The cutlery marked with green labels is prepared for the Moslem customer. They have 2 ramen shops in Hokkaido: Susukino main branch and the APIA store. We visit the main branch one in Susukino. The shops are quite easy to find, located just about 5 minutes walk from Susukino station. We visit the store during the Hokkaido winter festival and the store located just right in front of the Susukino site alley where you can see the beautiful ice sculptures. The shop is so famous, you might always see people lining up in front of the store to be seated. We wait for about 10 minutes before we can get inside the restaurant. They have 4 menus for you to choose: Kireuma miso ramen, Genghis Khan miso ramen, Genghis Khan karamiso ramen (spicy miso), and Halal spicy gyoza. They use miso as their soup base, which they made by using 10 selected ingredients. The soup is thick and has a strong mutton flavor. The Genghis Khan topping tastes juicy and tender. On top of that, it is so hard to find halal gyoza in Japan; and they nailed it perfectly. Needless to say, this is the best ramen I ever had in Japan. (Content writer: Annisa Noorhidayati/AN 2019).